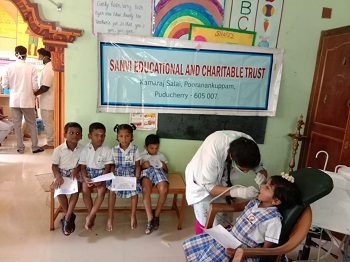 Comprehensive dental treatment camp was conducted by Department of Public Health Dentistry, Indira Gandhi Institute of Dental Sciences, Sri Balaji Vidyapeeth at Sanvi Educational & Charitable Trust, Pooranakuppam, Puducherry, on 09th April 2019. A total of 110 children were screened for oral and maxillofacial diseases of which 49 were males and 61 were females. Restorative procedures were done for 57 children. Oral prophylaxis and scaling were done for 98 children.